Castlemaine Perkins is one of Australia’s leading beverage manufacturers and has been brewing XXXX beer for Queenslander’s since 1878. 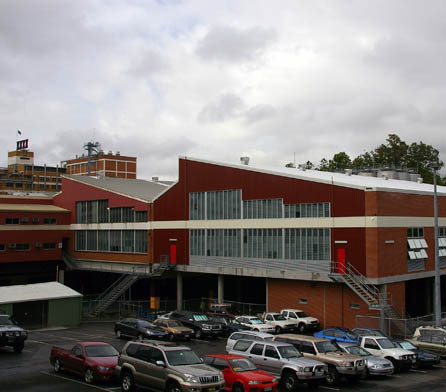 The XXXX brewery at Milton is an iconic landmark on the Brisbane inner city landscape. Wiley were asked to tender on this design and construct project, based on their successful commissioning of many food and beverage facilities for other Australian brands such as Golden Circle, Cadbury Schweppes, Bundaberg Brewed Drinks and Paramlat. Wiley were required to construct a large production area with minimal column intrusions, while maintaining the aesthetics of the neighbouring bottling building. Completing the project within the client’s tight deadlines. Design of a suspended post-tensioned concrete floor slab with a lightweight steel portal frame and external masonry skin which was in keeping with the appearance of the existing facility. Construction of a 1,500m2 slab in a single pour requiring 600m3 of concrete, 90 concrete trucks, 2 boom pumps, road closures and 50+ concreters. A new packaging hall that optimises the productive inner space while achieving a seamless aesthetic transition into the external look and feel of the iconic neighbouring building.